Mullein is one of the premier cough and respiratory remedies of the Europrean tradition. It is particularly used for a dry and irritable cough. 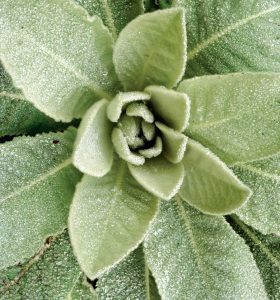 Mullein opens the lungs, reduces coughing and tightness, lubricates the mucosa, relaxes the larynx, opens the sinuses and creates a feeling of openness in the head. Mullein also has an influence on the nerves and the mind. It has a calming effect on inflamed and irritated nerves. We pick the leaves in the spring. The leaves are most often dried and used in tea in combination with other herbs. We also tincture them fresh to use in respiratory formulas. Mullein can be used as a dry herb tea or fresh herb tincture. The dry herb can also be smoked and is often part of smokers transition blends. Decoct 1 part astragalus, 1 part schisandra, and 1/4 part licorice for 10-15 minutes. Turn off the heat and add 1 part plantain and 1 part mullein, cover and let steep for 5 to 10 minutes. This tea is generally soothing and building to the lung tissue. Drink as needed or as a tonic. Mullein flowers and garlic infused into olive oil are a go to remedy for ear infections. Mullein flowers are a beautiful yellow and when they come, are in abundance. Pick the flowers straight into a bag trying to minimize contact with the skin as the oils on our hands diminish the quality of the medicine. Pour the flowers directly into a jar and cover with oil and infuse for 4 weeks. Make an oil of garlic (using olive oil as the base) and mix the two in equal parts to be applied directly to the ear. To use first warm the oil to body temperature and using a dropper apply 3 to 4 drops into the ear. Massage the outer ear and around the base of the ear after applying. Administer the oil every 30 minutes or as needed.